SANTA MONICA, CALIF.—The future of rheumatoid arthritis treatment should involve targeting subclinical disease and reversing immune dysregulation, Paul Emery, MA, MD, said here on May 18 at the California Rheumatology Alliance 9th Annual Medical and Scientific Meeting. To target treatments, it will be important to better predict synovitis, since synovitis predicts erosions in individual joints, said Dr. Emery, professor of rheumatology and head of the academic unit of musculoskeletal disease at the University of Leeds in Leeds, U.K. “I think we’ll have sophisticated imaging at onset so you could visualize what you’re getting very easily,” he said. Another important development will be predicting treatment response, Dr. Emery said, noting that unsuccessful methotrexate (MTX) treatment isn’t a benign event because during the period of treatment, irreversible damage can happen. He said there also could be an effect making the acute disease less responsive to therapy. Predictors would help determine which patients should receive a more aggressive treatment response before damage occurs, he said. Dr. Emery cited a study that sought to identify whether interleukin (IL) 7 titers in serum could identify which patients with inflammatory joint symptoms would evolve toward RA.1 The study included 250 patients with inflammatory joint symptoms and 80 healthy controls. 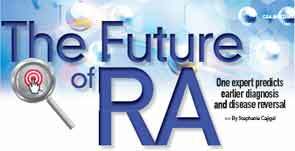 RA progression was monitored over the span of five years. Findings showed that, in patients with undifferentiated RA, low IL-7 levels at onset of symptoms will predict regression to more severe disease and can serve as a diagnostic biomarker, Dr. Emery said. Predicting B-cell responses may also help in treatment, he said, citing a study showing the importance of B-cell depletion as a biomarker.2 The researchers tested the B-cell levels of patients who were already being treated with rituximab. If their B cells were depleted, they were given standard therapy. If patients still had B cells, they were randomized to either standard therapy with placebo or standard therapy with an extra infusion of rituximab. The patients who were treated a second time not only depleted, they also had better clinical responses. Another prediction: Higher remission rates will become standard. “In the future, if you’re not getting 70% remission rate with in your new patients, you’re not treating your patients very well. That’s what you’re going to be told,” Dr. Emery said. He also predicted that, in the U.K., rheumatologists will eventually be asked by the government to publish patient-reported outcomes and remission rates. “If you’re able to get remission rates up, you’ll get patients in [for treatment] very early indeed,” he said.